I used the PoultryMate for the first time this Thanksgiving and all the guests said it was the best turkey that they had eaten. It was juicy and delicious!! It was easy to use and the directions on the package were right on as far as timing...I will use it every time I need to cook a whole bird. Attached is a picture of our bird...the most beautiful we've had in a long time, I must say. My first time ever cooking a Turkey 旅 and I followed the instructions exactly as they stated. Let's just say the bird was ABSOLUTELY amazing and didn't even have any leftovers to bag up! I was elected to make the turkey from here on out! Hahah! Thank you so much for your awesome product! Used the PoultryMate today for Thanksgiving. It was amazing. My family said it was the best turkey they ever tasted. Yummy! We used our PoultryMate for the first time today and it worked GREAT! Our 12 lb. turkey came out SO tender and was done in half the time! We ordered the larger PoultryMate and received it just in time for Thanksgiving! We were so excited to try it out! Our turkey weighed in at 18.4 lbs which would normally take about 4 hrs to cook it! With the PoultryMate, we got the turkey totally cooked in 2 hrs 20 minutes!! It was 172 F and really juicy! Everyone remarked how moist and delicious the turkey was! Thank you PoultryMate for this great product! 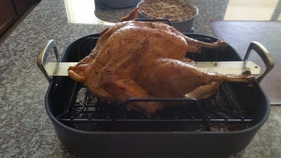 Attached is a photo of our 12 lb turkey, brushed with canola oil, salt, and cracked pepper. Total roasting time per instructions 98 minutes. 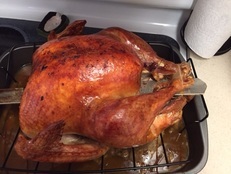 Our turkey came out perfect, tender and juicy, in under 2 hours. We love the PoultryMate and will be recommending it to friends and family! The PoultryMate worked better than I thought it would. I used the recipe to 'crisp' the skin of the bird and it turned out great. Thank you. Our 23 lb. 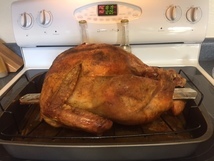 bird turned out delicious! Thank you!! ​The PoultryMate worked the way you said it would . The bird was a hit and no leftovers. Thank you. We love your product. My wife cooked a 19 lb. turkey for Thanksgiving in 2 1/2 hours. This was way too easy!!! The Turkey came out super moist and delicious using the PoultryMate!!! Our family loved it. We have already started telling our friends about your product. Now that the work is out of cooking a turkey, I'm gonna get turkey more often. Lol! Thank you, thank you, thank you. --Josiah S.
Thank you so much for the PoultryMate!! Turkey came out awesome on Thanksgiving. 20 pound turkey only took 2 1/2 hours!! We love our PoultryMate and the bird turned out just perfect! Wish I had taken a picture, it was golden brown and just delicious. Thanks! I tried cooking a whole chicken for the first time (at 22 years old) because the PoultryMate was recommended to me. I honestly couldn't believe how well it turned out! The meat was really juicy and tender, the time calculations were right on point and the cooking instructions were super easy to follow. I will definitely be cooking more whole chickens in the future and highly recommend this product to everyone that cooks!! Here is a picture of a 6 lb. chicken that I cooked in 62 minutes. Truly super juicy! I brushed olive oil and seasoning first. I also put slices of lemons and apples in the bottom of the pan. I love cooking my whole chickens with the PoultryMate! It is so simple to use and I get delicious results every time. Follow the easy cooking directions and you will have a beautifully browned bird on the outside and a tender and juicy one on the inside - in less time! I won’t cook my whole chickens any other way now. I am so excited to cook our holiday turkey using this product. Yum! I can’t begin to tell you how much this PoultryMate has changed my complete view when it comes to roasting a chicken or a turkey!! As like most parents in today’s world, we are on the move every second of the day and after school we don’t stop until our babes are in bed. I wish I could say I’m good at planning meals for our family, but let’s just say it’s not my area of strength. When I found this product, it has fit into my crazy schedule perfectly. I now can cook a full chicken in literally half the time. I wouldn’t have believed it until I tried it. Honestly, EVERY time it cooks to perfection and my entire family eats every bit of it. I will never be able to cook a bird without one ever again!